Túrkeve is a town in Jász-Nagykun-Szolnok county, in the Northern Great Plain region of Hungary. Zoltan Korda was a Hungarian-born motion picture screenwriter, director and producer. He made his first film in Hungary in 1918, and worked with his brother Alexander Korda on film-making there and in London. They both moved to the United States in 1940 to Hollywood and the American film industry. 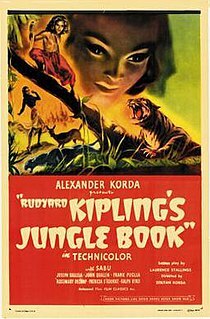 Jungle Book is a 1942 independent Technicolor action-adventure film by the Hungarian Korda brothers, based on a screenplay adaptation by Laurence Stallings of Rudyard Kipling's The Jungle Book, about a wild boy who is kidnapped by villagers who are cruel to animals as they attempt to steal a dead king's cursed treasure. 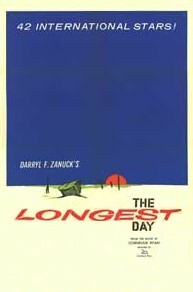 The Longest Day is a 1962 epic war film based on Cornelius Ryan's 1959 book The Longest Day (1959) about the D-Day landings at Normandy on June 6, 1944, during World War II. The film was produced by Darryl F. Zanuck, who paid author Ryan $175,000 for the film rights. The screenplay was by Ryan, with additional material written by Romain Gary, James Jones, David Pursall, and Jack Seddon. It was directed by Ken Annakin, Andrew Marton, and Bernhard Wicki. Marius is a 1931 French drama film directed by Alexander Korda. It is based on the play with the same title by Marcel Pagnol. The film is a part of a trilogy which includes the films Fanny and César. The film was selected to be screened in the Cannes Classics section of the 2015 Cannes Film Festival. The restored film was also given a limited re-release in the United States by Janus Films on January 4, 2017, first premiering at Film Forum. Men of Tomorrow is a 1932 British drama film, directed by Zoltan Korda and Leontine Sagan, produced by Alexander Korda and written by Anthony Gibbs and Arthur Wimperis. It stars Maurice Braddell, Joan Gardner and Emlyn Williams and features Robert Donat's movie debut. Wedding Rehearsal is a 1932 British romantic comedy film directed by Alexander Korda and starring Roland Young as a bachelor forced to seek a wife. Joseph M. Newman was an American film director most famous for his 1955 film This Island Earth. His credits include episodes of The Twilight Zone and The Alfred Hitchcock Hour. Arthur Edeson, A.S.C. was a film cinematographer, born in New York City. His career ran from the formative years of the film industry in New York, through the silent era in Hollywood, and the sound era there in the 1930s and 1940s. His work included many landmarks in film history, including The Thief of Bagdad (1924), Frankenstein (1931), The Maltese Falcon (1941), and Casablanca (1942). John O. Aalberg was a Hollywood sound technician who worked on films including Citizen Kane and It's a Wonderful Life. He was a ten-time Oscar nominee, and received three technical awards from the Academy. Georges Périnal was a French cinematographer. He is best known for his works with Jean Grémillon, René Clair, Jean Cocteau, Michael Powell, Charlie Chaplin, Otto Preminger. John Edward (Jack) Otterson was an American art director. He was nominated for eight Academy Awards in the category Best Art Direction. He worked on 300 films between 1934 and 1953. Nathan Levinson was an American sound engineer. He won an Oscar in the category Sound Recording for the film Yankee Doodle Dandy and was nominated for 16 more in the same category. He was also nominated seven times in the category Best Special Effects. Thomas T. Moulton was an American sound engineer. He won five Academy Awards in the category Sound Recording and was nominated for eleven more in the same category. He was also nominated four times in the category Best Visual Effects. Edmund H. Hansen was an American sound engineer. He won two Academy Awards; one for Best Sound Recording and the other Best Visual Effects. He was nominated for another 12 films across the two categories. Elmer R. Raguse was an American sound engineer mostly associated with the Hal Roach Studios. He was nominated for eight Academy Awards in the categories Best Sound Recording and Best Effects. Loren L. Ryder was an American sound engineer. He won five Academy Awards and was nominated for twelve more in the categories Best Sound Recording and Best Effects. Jack Whitney was an American sound engineer. He won two Academy Awards, one for Best Sound Recording and the other for Best Visual Effects. He was nominated six more times in the category Best Sound. Lawrence W. Butler was an American special effects artist, best known as the inventor of the bluescreening process. He won an Academy Award for Best Special Effects and was nominated for three more in the same category. Ted J. Kent was an American film editor who was nominated for Best Film Editing at the 1964 Academy Awards for the film Father Goose He worked on over 150 films from 1929 to 1967, including many classic Universal horror films. Gene Havlick was an American film editor. Al Clark was a prolific editor whose career spanned four decades, most of which was spent at Columbia Pictures. He was nominated for 5 Academy Awards and 1 Emmy during his career. He is credited with editing over 120 films, and towards the end of his career, in the 1960s, he also edited several television series. ↑ "The 13th Academy Awards (1941) Nominees and Winners". oscars.org. Archived from the original on 6 July 2011. Retrieved 12 August 2011. ↑ "The 14th Academy Awards (1942) Nominees and Winners". oscars.org. Archived from the original on 6 July 2011. Retrieved 13 August 2011. ↑ "The 15th Academy Awards (1943) Nominees and Winners". oscars.org. Archived from the original on 6 July 2011. Retrieved 13 August 2011. ↑ "The 35th Academy Awards (1963) Nominees and Winners". oscars.org. Retrieved 23 August 2011.